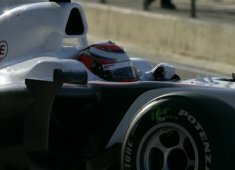 The second day of testing in Jerez was held in lot better weather conditions as the track dried quickly in the morning. With Kamui Kobayashi being one of the drivers completing in excess of 100 laps and setting the quickest lap time of the day on his final run, the BMW Sauber F1 Team enjoyed a busy and productive day of testing. What comes next: For tomorrow and Saturday Pedro de la Rosa will be on duty at the wheel of the BMW Sauber C29 Ferrari.